Image: Visitors chat next to the Ebay logo at the CeBIT computer fair in Hanover. Online retailer Ebay Inc said it plans to cut about 2,400 positions, or 7 percent of its workforce across eBay marketplaces, PayPal, and eBay enterprise in the current quarter to simplify its organizational structure. 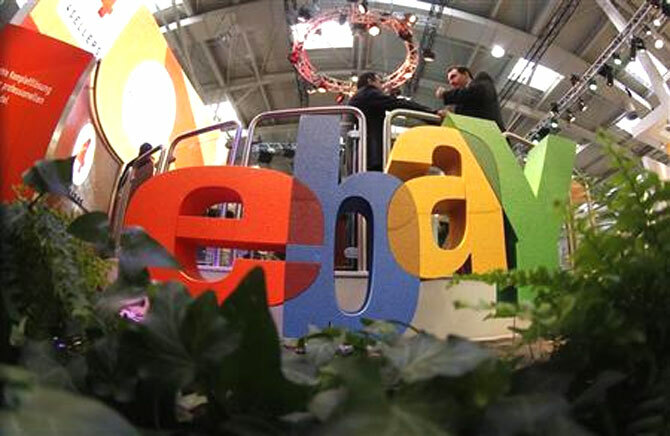 The company also said it will explore strategic options for eBay enterprise, including a sale or an IPO. EBay's net income rose to $936 million, or 75 cents per share, in the fourth quarter ended Dec. 31, from $850 million, or 65 cents per share, a year earlier. Revenue rose to $4.92 billion from $4.53 billion, boosted by its PayPal payments unit and higher holiday sales. EBay said in September it would spin off PayPal in 2015, freeing the unit from the slower-growing traditional e-commerce business to allow it to strike deals in the rapidly evolving payments space. Meanwhile, EBay Inc's plans to break up into three different companies could accommodate would-be suitors, signaling a potential merger fight after the breakup. The moves come as Wall Street analysts question how long eBay and PayPal can withstand growing competition from online rivals such as Amazon.com Inc, Google Inc and Alibaba Group Holding Ltd, as well as retailers such as Wal-Mart Stores Inc which are investing in their own e-commerce and payments platforms. Any investor who owns 20 percent of PayPal will be able to call special meetings of shareholders, Icahn said in a separate statement that coincided with eBay's release. EBay also outlined plans to cut 7 percent of its workforce, or 2,400 positions, in the current quarter. The eBay Marketplaces unit is now going after so-called "avid" shoppers hungry for a bargain. Its enterprise division, which advises companies on how to grow online, will strengthen its relationships with top retailers and brands. Potential buyers of eBay Enterprise include companies focused on building ties with other businesses, such as Salesforce.com Inc, IBM Corp, Demandware Inc , Adobe Systems Inc or startup Bigcommerce, some experts said. Can Nikhil Nanda turn around Escorts?